In movies, we see people performing CPR—whether they went under training or not. In most cases, they first ask the victim questions or gently pat his/her cheeks. If he/she is unresponsive, then the valiant bystander performs chest compression. After a moment of pressing, mouth to mouth will be done for oxygen. Momentarily, the victim wakes up and the people surrounding them will cheer with joyous relief. And the scene is cut after that. Seems easy, right? In reality, it’s more than just chest pumping and giving mouth-to-mouth. Just like any other medical procedures, there is a process to follow and appropriate techniques to apply. In the medical field, misdiagnosis and improper handling of a patient will surely cause more harm than aid. Imagine, a man suddenly goes into cardiac arrest. You rush towards him while refreshing in your mind what you learned from CPR training years ago. Among the sea of civilians, you are the only one concerned enough to aid the man. You perform CPR, just like in the movies, until a medical team arrives. Afterwards, the paramedic will diagnose the man not only with cardiac arrest, but also a broken rib and several internal organs. Don’t want that to happen to you? You’re in luck! 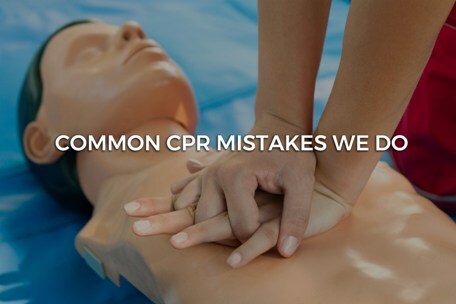 We’ve compiled all common mistakes made when giving CPR, to help you refresh what you learned or guide you if you’re just about to start your class. Most people forget that the weight of the rescuer must be utilized to propel proper compression. In order to do so, the arms must be stretched out when pumping. After pushing down, the rescuer’s hand must not be lifted off the victim’s chest. This will ensure that the rescuer is not just “bouncing” up and down. Improper CPR handling, such as “bouncing,” is futile in delivering compressions and may result in a broken rib. We don’t usually see the position of the hands when people give CPR in movies. From afar, you would think that the hands are just locked over together. Unknown to many, such hand positioning may result in a broken rib or breastplate. It may even end up as bad as the lungs or liver bleeding. To deliver the right pressure for proper compression, one hand must be straight on top of the other. Providing CPR is tiring, and it’s tempting to press from an angle halfway through the aid. The rescuer’s shoulder should be hovering over the victim, this will ensure straight delivery of compression to the heart. Using the fingers will not deliver the appropriate compression. In order to achieve the proper depth, the heel of the hand must be used. This part of the hand can provide more compression compared to the fingers. Similar to Goldilocks’ porridge, the pressure of the compression must be “just right.” It should not be too deep, because it may result inan internal injury. If the compression is too light, blood will not flow properly from the heart to the brain. In some movies, rescuers start with providing mouth-to-mouth. Providing oxygen is not the main priority in most situations. Immediately after passing out, ample level of oxygen is still retained in the blood. There is a more urgent need to deliver oxygenated blood to the brain and secure stable circulation. Calling for an emergency medical team tends to be postponed until after the victim responds. This should not be practiced since extensive care may be needed. Also, giving CPR can be exhausting, and rescuers can only do it for a short amount of time. The earlier the medical team is called, the earlier they can arrive and provide extensive medical care. There are many aspects to consider when delivering a CPR for an emergency. Mastery of medical care can only be achieved by enrolling in a CPR training program. A CPR will only be successful if techniques are properly executed. Both the CPR aid and calling the emergency medical team must be done with the right timing.